Indigo Quilt: Part 3. Completed! 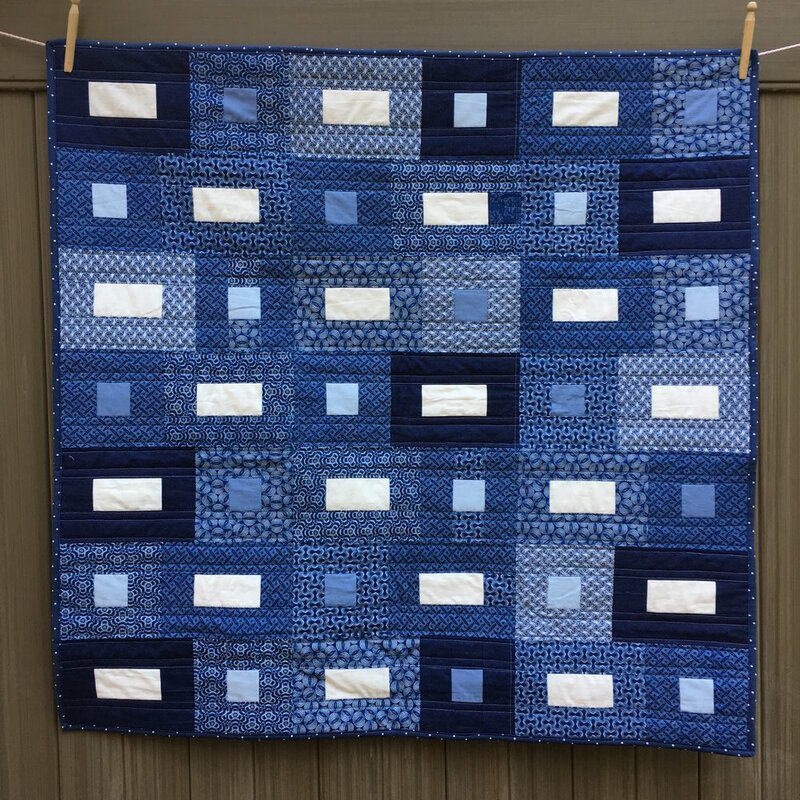 My Indigo Color quilt is done! The South African Shweshwe fabrics featured in the quilt are made with indigo dyes. 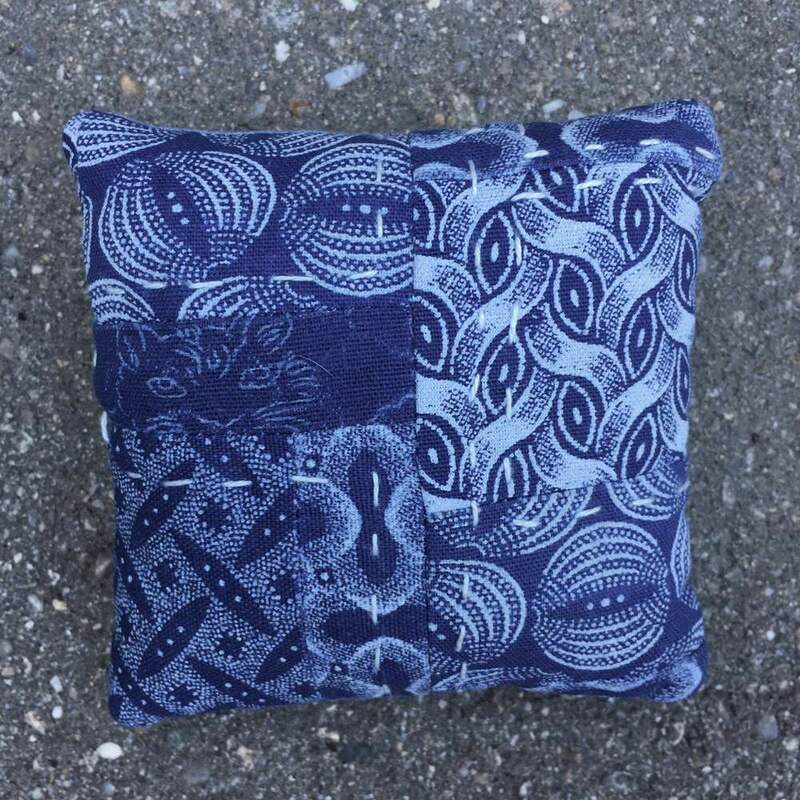 I added some Kona® cottons and one other dark blue fabric. Just as I did with the pincushion I made with these fabric, I flipped one of the pieces in this quilt to show a portion of the da Gama Three Cats (Trade Mark) logo which is printed on the back of this company's fabrics. The cats can be seen in the second from bottom row, the 3rd block from the left! Here's the back of the quilt, with my Labrador mix, Hazel, who came with me on the photo shoot! And a photo of the entire quilt. I love it! There is so much motion in the shweshwe fabrics! I designed the pattern I used for this quilt. If you interested in learning more about Shweshwe fabrics, click the link at the top of this post which will connect you to da Gama Textiles in South African which makes this fabric. There is also information in my March 14, 2016 post. 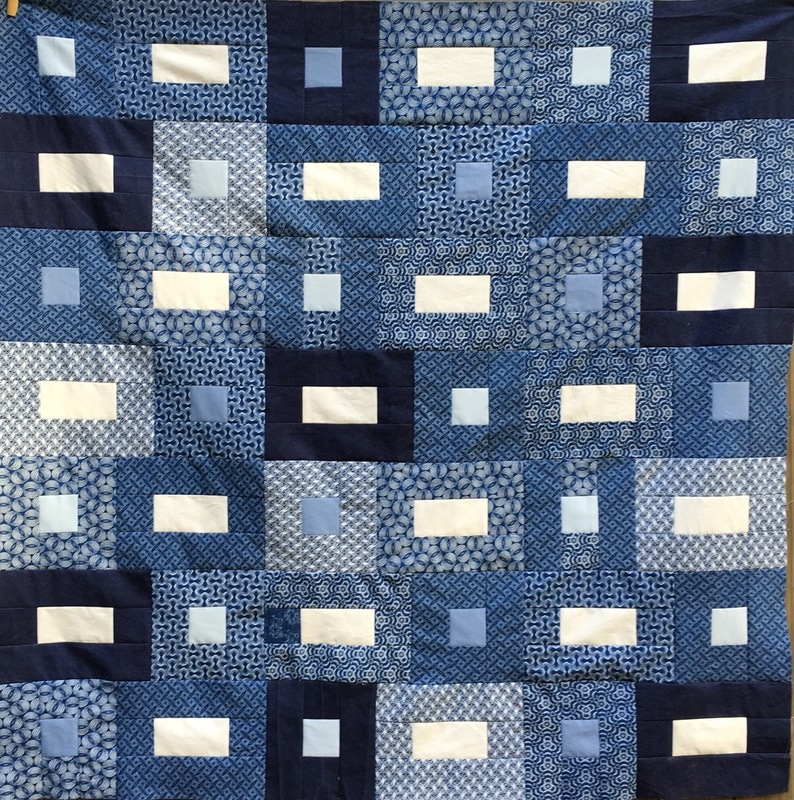 The Indigo Quilt top, featuring 3 Cats shweshwe indigo fabrics, came together beautifully. I didn't have enough shweshwe for the entire quilt so used a bit of dark indigo blue colored cotton fabric from Connecting Threads from my stash. The light center fabric the Kona® cotton solid "Snow' and the light "Bluebell" and medium blue "Denim"* are also Kona® cotton solids. (Note how those 2 colors of solid blue appear to be different depending on the fabric around them. It looks like there are more than 2 blues but it really is just 2 shades)! When I drew this pattern, I had the center row of each block all facing east-west. But when I put it up on the design wall, I found that turning the square blocks so that the center section runs north-south was much more interesting. Added bonus: When assembling the quilt, I didn't have to match those center sections! Just as I did with the pincushion in my previous post, I turned one small square block over to show the 3 Cats from the printed label! It's fun and it identifies the fabrics as authentic Da Gama Textiles for anyone looking at this quilt in the future. *Note: I attempted to match the 2 blue Kona® fabrics I used with the Kona® color chart with actual swatches of fabric. I think picked the correct names but am not a 100% sure. I do wish Robert Kaufman Fabrics would print the name and/or number of the color on the selvage of their Kona® solid fabrics! It would so helpful! Indigo blocks ready for assembly and the quilt's label in front. 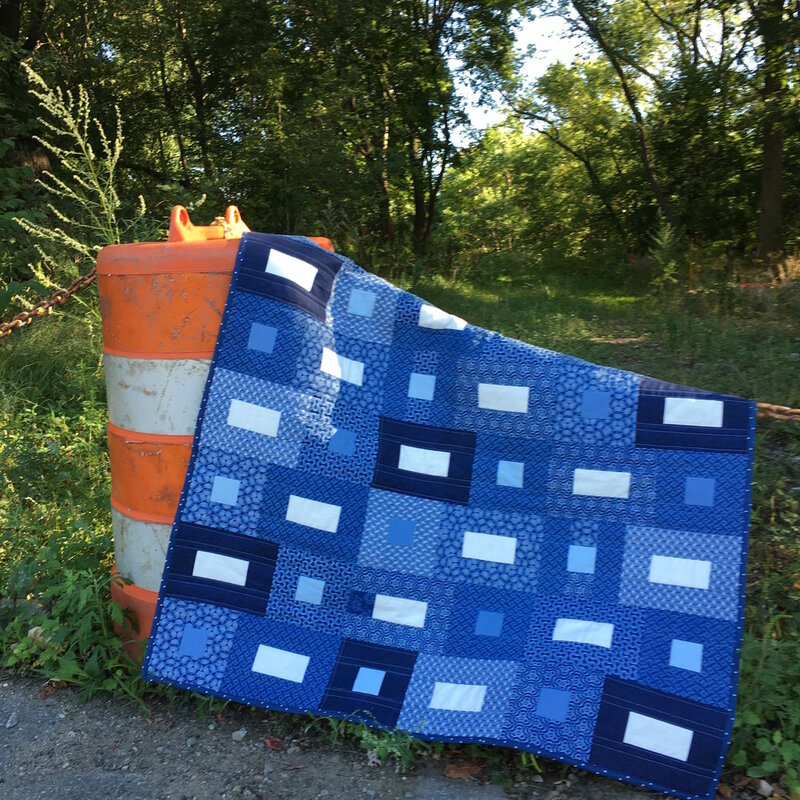 The indigo quilt that I discussed in my post on July 11 is cut out and ready to sew! The featured indigo fabrics are Shweshwe from South Africa. Every bit of this fabric is precious--I only had 4 fat quarters and one half yard. I needed to cut it carefully! I ended up with a couple strips too narrow for this project and a few scraps. It was too late in the day to start a big sewing project but not too late to use some of those scraps for a 4 inch square pincushion! The fabric's logo is 3 cats, printed on the back of the fabric. I found one cat's face on a scrap. I sewed it into the pincushion's top, wrong side out! Can you see the kitten peaking through the pieces?